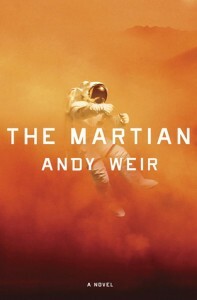 I'm fudging a bit with The Martian, by Andy Weir, for my 2016 (Blended) Reading Challenge. It's going in my 'TBR' (to be read) section even though it's not a 'book I already owned'. It is, however, a book I checked out from the library e-loans a long time ago as my 'book that became a movie' choice for last year's 50 Book Challenge, barely started, and had to wait in queue for like 6 months for another chance. I'll disclose up front that I am not a hard sci-fi fan. I can appreciate when it's well done (and it is), but it's not really my thing. I do, however, love a well-done epistolary novel, so I figure they cancel each other out as far as enjoyment and star-rating consideration. I quite enjoyed this book, but I'm a bit of a nerd myself and mostly enjoyed Mark Watney's sense of humor, which seems to be the dividing force between people who love the book and those who hate it. He was fun to read, even when he was talking about math and science. Everything in the book seemed plausible and rooted in fact about Mars, even if he did manage to keep some things together through sheer ingenuity and duct tape. That's what makes it a fun, fictional read. He was the sole character for a good portion of the book, and that didn't hurt the story at all, which is pretty impressive. It's also impressive that the author designed his own NASA-esque software to actually figure out trajectories and velocities and whatnot, but that's the stuff I tend to glaze over with an 'if you say so' and not stop to work out/fact check. I liked it, it was admittedly well done and a very enjoyable read, so why can't I bring myself to give it five stars? I'm not entirely sure myself, but it just didn't wow me in a five star way, or even on the level that it seems to wow most people. I didn't even get past page 10 or so the first time I tried to read it, so despite a premise I'm usually all about (and an admittedly great opening hook), it still didn't seem to really hook me. Even once I resolved to read it through for real this time, I wasn't actually 'hooked' and propelling myself forward to find out what happened until well into the second half of the book. I'd pick it up in a waiting room or while riding shotgun, but otherwise I just wasn't that into or overly concerned about it. A few things came off a bit distasteful with hints of misogyny and homophobia ('gay probe' joke wasn't funny). Not much, and I guess (sadly) not wholly unexpected in a book about a cis straight white guy written by a (presumably, from what I've seen & read) a cis straight white guy. And really, after reading some of the other reviews that helped me figure out just what bothered me, I think most of it actually comes down to emotional realism. Science and math that didn't completely bore, realistic-yet-speculative setting, plausible obstacles to overcome with fun and interesting approaches to, a voice/sense of humor that I generally dig...but the dude was on Mars for something like two years, and besides the occasional “well, f---”, there's no real emotional depth or substance regarding his emotional and mental plight. Isolation is one of the hardest obstacles astronauts (or any survivalists) face, and yet it wasn't really even dealt with. I know he was chosen for a great personality, but especially after losing a chance at communication, I would have liked to see some real inner obstacles faced and grappled with as opposed to more whining about disco or Three's Company. I also felt that both the switch to third person and the ending were pretty abrupt. The hopping between first person logs and third person narrative was well done, even if the other characters were really superficial (Commander astronaut, foreign-sounding astronaut, suave minority astronaut, female astronaut, NASA guy in charge, satellite picture watcher, press gal...), but I think maybe it should have been done much earlier in the book. At least move some of the chapters from Mark's crew's POV up to the beginning, because it was very jarring to go through so much Mark/1st person logs and then suddenly switch deeper into the book. Still, an overall great read and impressive book. I'm looking forward to watching the movie now that I've read it, and I'll definitely read more sci-fi by Weir if I come across it. I listened to the Martian as an audiobook and it was really fun, I think, because of the different voices that made it more like listening to a play or movie. I don't know how it would feel 'on paper' without that to make it less heavy. I see what you're saying about the isolation aspect--I hadn't thought about that, it should have been there, but it also would have made the book something completely different. I thought the movie was very good. I'm sure it was a fun audiobook, and probably a very fun movie! I wish I could do audiobooks, because I'd probably enjoy many more books that way, but I've never been able to follow people reading aloud. I did enjoy most of it, but I definitely think some kind of isolation thing should have been an issue at least at the end, like once it's over it all sinks in. The ending seemed very abrupt to me, and I get it, because we know he got through it all and is going to be okay. I think I would have given it five stars if it had gone a little deeper with that. I was actually surprised when they mentioned that it had been a year and a half or something like that, because it read more like a few months to me. The movie kind of glosses over the timeline, too. That makes it seem more plausible that he stays chipper.